When you're shopping for a motherboard for your custom-made PC, look for a few important features. First is support for USB 3.0, which prepares you for the future. Second is 6-gbps SATA ports, which will support faster data-transfer rates on newer hard drives and on solid-state drives (not to mention the fact that more SATA ports will allow room for attaching more devices). Third, if you’re using a Sandy Bridge CPU such as the Core i5-2500K or Core i7-2600K, you’ll need a motherboard with the 1155 Socket. This motherboard offers four DIMM slots to accommodate a maximum of 32GB of RAM, and it supports overclocked RAM at speeds up to 2133MHz. You’ll also find a pair of 6-gbps SATA ports, as well as four 3-gbps SATA ports. The ASRock P67 Pro supplies six USB 2.0 ports and two USB 3.0 ports, as well, but only a single PCI Express 2.0 x16 slot; this arrangement limits you to one graphics card, but that should suffice for a budget PC. For systems using AMD processors, motherboards with the AM3+ socket are the way to go. 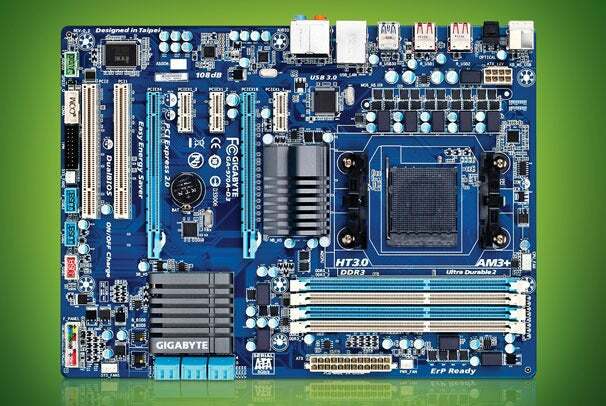 Although the Gigabyte GA-970A-D3 is inexpensive, this motherboard doesn’t scrimp on features. Built on the AM3+ socket, the GA-970A-D3 offers four DIMM slots to hold up to 32GB of RAM, with support for memory overclocked to speeds of up to 2000MHz. It also provides a pair of PCI-E 2.0 x16 slots, six 6-gbps SATA ports, eight USB 2.0 ports, and two USB 3.0 ports. For just $90, you’re getting an excellent package here. For a high-performance PC, select a board with at least one PCI-Express 3.0 slot. Currently, not too many products take advantage of PCI-E 3.0’s extra bandwidth, but you’ll want the capability in the future. My choice is the Asus P8Z68-V PRO/GEN3 (yes, that name just rolls off the tongue). It’s built on the new Z68 chipset, which essentially combines the P67’s overclocking support and the H61’s integrated-graphics support. The latter gives you access to Intel’s Quick Sync technology, which speeds up video-conversion tasks immensely. The integrated graphics also can step in when your graphics tasks are less strenuous--say, when you’re watching a YouTube video--allowing your discrete graphics card to power down, and saving a bit of energy. On top of that, the chipset supports Intel’s Smart Response technology, which lets you section off part of an SSD to serve as a cache for a conventional hard drive, speeding up performance. 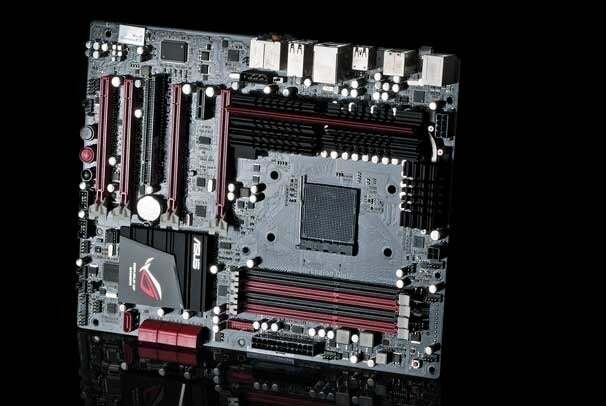 This motherboard has four DIMM slots for up to 32GB of RAM, and it supports overclocked RAM at speeds up to 2200MHz. Notable features include two PCI Express 3.0 x16 slots (which makes room for two graphics cards working in tandem); four 6-gbps SATA ports and four 3-gbps SATA ports; Bluetooth, VGA, DVI, and HDMI ports; two USB 3.0 ports; and six USB 2.0 ports. Among my favorite features are the built-in power and reset switches, which are helpful for troubleshooting when you’re tinkering inside the PC. You can find lots of motherboard options for high-end PCs built on AMD CPUs, but I like the Asus Crosshair V Formula. It too packs four DIMM slots for up to 32GB of RAM, and it supports memory overclocked to speeds of up to 2133MHz. You get six 6-gbps SATA ports, 12 USB 2.0 ports, and six USB 3.0 ports. This board adds a third PCI-E 2.0 slot; the slots support x16 data-transfer lanes, but the board throttles power down to x8 lanes when two or more graphics cards are installed. You can use that third slot for a third graphics card, a Wi-Fi adapter, or a TV-tuner card. As you're selecting components for your tailor-made PC, you'll probably find that settling on the amount of memory is the easiest decision you'll have to make. Since RAM has become incredibly cheap, you have little reason not to grab a hefty amount. 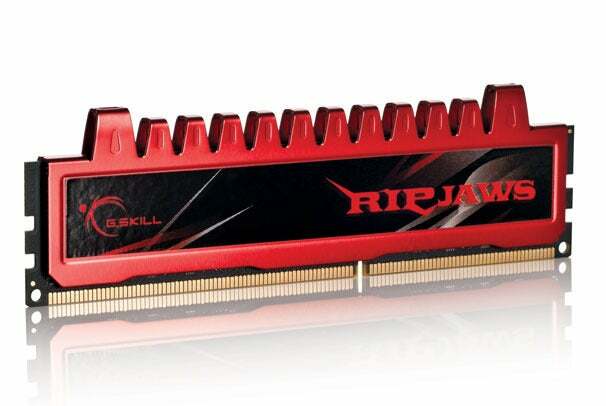 The G Skill Ripjaws are speedy, and equipped with heat spreaders to regulate temperatures. The modules themselves happen to look great, too (if RAM turns you on, that is). More important, you can find 8GB of this memory for as little as $50. Faster RAM is available on the market, but if you’re simply looking to minimize multitasking bottlenecks, this choice of RAM is a steal.